A rare yet equally fascinating variety of the Ruby gemstone, Star Rubies exhibit a special effect called “asterism”. This effect is a beautiful display of a six-rayed star that shines over the gem’s surface when it is moved. The silky shine of the star is attributed to rutile inclusions. How the star-effect in star rubies occur? 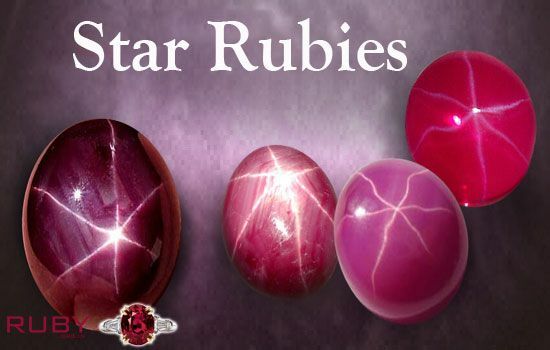 The dense inclusions of tiny needle-like inclusions of rutile, called silk, are responsible for creating the magnificent star-effect in these natural rubies. The phenomenon occurs when light reflects from rutile inclusions aligned perpendicular to the rays of the star. The presence of rutile is, thus, considered desirable in star rubies. Are Star Rubies easily available? 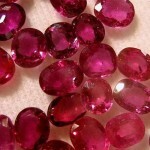 Well, the availability of star rubies is a big concern for the gem lovers and sellers today. Approximately, from every 100 rough corundum gemstones that are mined, only three get the star effect after they are given the cabochon cut. But, not all these star rubies are perfect. 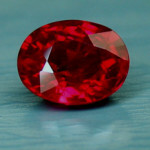 One may not have the right color; one may not have the ideal star – leaving the probability of producing the perfect star ruby gemstone to one in hundred. As many rubies are given faceted cuts, the production of star rubies is becoming rare due to the shortage of cabochon cut rubies. What are the sources of Star Ruby? 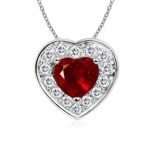 Some of the highly popular sources of ruby gemstone from where star rubies are mined include regions like Burma (Myanmar), Sri Lanka, Africa, Australia, India, Cambodia, Thailand, Pakistan, Afghanistan, the United States, and Vietnam. The most commonly found Star Rubies are sourced from Indian and Africa. What determines the value of star rubies? The sharpness of the star has a great impact on its real value. Ideally, the star should be sharp and not hazy. It should have milky white or silver in color. When looked in the sunlight, the rays of the star should be straight and easily visible. The star should be in the center of the gem. But, when the stone is moved, the star should also be able to glide around the stone. 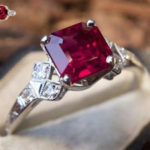 Natural ruby gemstone is known for their beautiful deep red color. 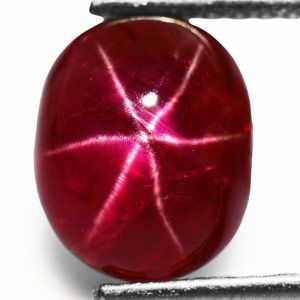 However, star rubies aren’t deep red in color. They are available in different shades such as pinkish-red, violet-brown, and violet-red, etc. more often than not, the color distribution of this stone is uneven. It is distributed in stripes and spots. 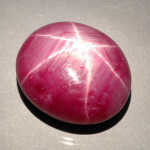 It is often seen that pink star rubies portray the perfect asterism effect. But, it is a red star ruby with the perfect star which is in high demand. Finding such a Manik gemstone is extremely rare, and thus, if found, then such a stone becomes highly expensive too. In order to get the perfect asterism effect, it is necessary to cut the ruby gemstone into medium to high domed cabochons. The shape of the cabochon cut should be round or oval. Also, care should be taken that the gemstone is neither too flat on the top, nor too heavy at the bottom. The bigger the size of the star ruby, the more worth it has. Generally, star rubies are found in 1 carat to 15 carats. You may find star rubies that create the perfect asterism effect but are not too big in size, and vice-versa. This is why finding a high-quality star ruby in a large size is rare and very expensive. Star rubies are not perfectly clear or transparent. They are translucent and mostly opaque with the presence of rutile inclusions.